The “torture report” exists. It shouldn’t—a better, more comprehensive, historically deeper and less partisan document should have been produced, and then held close for mandatory reading by all pertinent current and future officials—but it’s there. Anyone in the world who wants to read it can do a full download, and think what they think. Its overall content left me thinking of a conversation in the summer of 1988 with the pollster Bob Teeter, a thoughtful man who worked for George Bush ’s presidential campaign, as I did. I asked if he ever found things in polls that he wasn’t looking for and that surprised him. Bob got his Thinking Look, and paused. Yes, he said, here’s one: The American people don’t like the Japanese. It surprised him, and me, and I asked what he thought it was about. 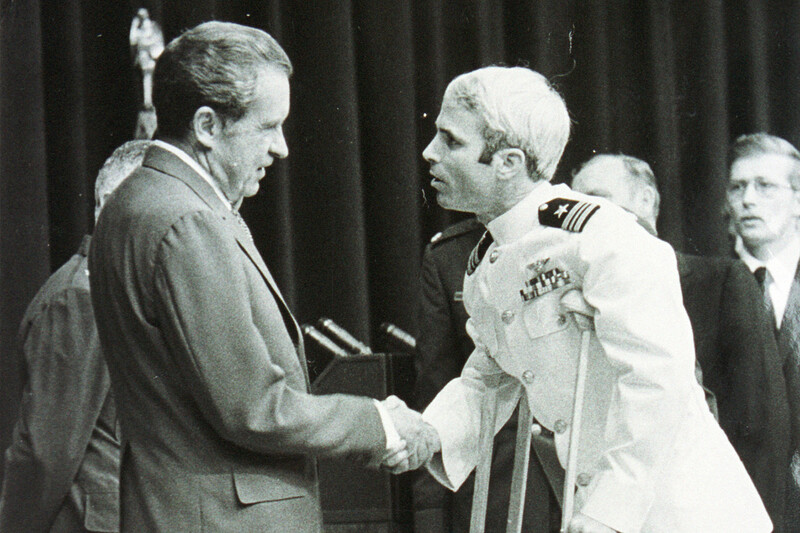 President Nixon greets John McCain in May 1973 after the Navy pilot’s release by theNorth Vietnamese, who had held him as a prisoner of war for more than five years. He didn’t think it was economic—he saw in the data that Americans admired Japan’s then-rising economy. He didn’t think it was World War II per se—he didn’t find quite the same kind of responses about Germany. We were quiet for a moment, and then our minds went to exactly the same place at the same time: Japanese torture of American soldiers in the Pacific war. The terrible, vicious barbarity of it. When the war ended, American boys went home, and the story of what they’d seen, experienced and heard filtered through families, workplaces and VFW halls. More than 40 years later, maybe it was still there, showing up in a poll. It was just our guess, but I think a good one. A nation’s reputation in the world will not soon recover from such cruel, systemic actions, which seemed to bubble up from a culture. You’ll pay a price in terms of the world’s regard. This is one of the reasons, only a practical one, torture is bad. It makes people lose respect for you. And when you come most deeply to terms with it, it can make you lose respect for you, too. The arguments over the deficiencies of the torture report—we’ll get to some in a moment—have in a way overwhelmed that point. But America should never again do what is asserted and outlined in the report, which enumerates various incidents of what I believe must honestly be called torture. American policy should be to treat prisoners the way we would hope—with clear eyes, knowing it is a hope—our prisoners would be treated. The war we are engaged in is different, we know, and it is still going on and will be for some time, but it won’t help us fight it to become less like ourselves and more like those we oppose. Torture is not like us. It’s not part of the American DNA. We think of ourselves as better than that because we’ve been better than that. It is almost childish to say it, yet children sometimes see obvious truths. We can’t use torture methods and still at the same time be the hope of the world. You’re an animal like the other animals or you’re something different, something higher, and known to be different and higher. Someone has to be the good guy. For a long time in the world that has been our role. You might say it bubbled up from our culture. We should not judge those who, in the months and years after 9/11, did what they thought necessary to forestall further attacks on America’s civilian population. They went with the legal guidance they had, propelled by the anxiety we all experienced. “There was no operating manual to guide the choices and decisions made by the men and women in charge of protecting us,” wrote former Nebraska Sen. Bob Kerrey this week in USA Today. None of them should be abused, embarrassed or prosecuted now. What the report contains is believable but insufficient; it’s not the whole story, it’s part of the story. Those involved in the episodes outlined should have been interviewed, and were not. The investigation and report should have been conducted so that they could win full bipartisan involvement and support, and were not. As for not interviewing all individuals involved, the committee staff’s rationale—“that some officers were under investigation and could not be made available—is not persuasive.” Most officers were not under investigation, and those who were saw the process end in 2012. There are more questions about the report. One is that it is generally understood to reflect longstanding tensions between the committee and the CIA. Another is the timing—the report was issued just as a defeated Democratic majority walked out the door, and has the look of a last, lobbed stink bomb: “See what the terrible Bush administration did? Bye now!” There is about the entire enterprise a sense of sin being expiated at someone else’s expense. The committee’s job is to oversee the CIA. If its own report is true, it didn’t do a very good job. It can be hard to take seriously a report that seems largely a product of partisan resentment, guilt and blame shifting. And yet it outlines believable incidents of what is clearly torture. The report is out there. If any good comes of it, it can be as a final demarcation between an old way of operating and a new one. Can the GOP Find Unity and Purpose?